Corporate text messaging utility is wireless information carrier solution that can easily send unlimited text messages by just a single click at both national and international mobile networks. Message broadcasting software sends global messages, job, event alerts and business campaigns, stock updates simultaneously to the group of CDMA or GSM cell phone users without any internet connection. Free SMS tool support Unicode supported languages. ...... from PC to mobile phone connected via Microsoft Active Sync and windows mobile device center. Group SMS sender application has the ability to send text sms in all Unicode supported languages like Hindi, Arabic, Germen, Chinese, Greek, French, Spanish etc. Leading bulk SMS providers helps users to compose or send infinite text messages to make one to one interaction between sender and receiver. Group messaging utility has user friendly GUI facility that makes process easy to use. * Mobile messaging is wireless information carrier solution that composes and sends unlimited text messages at both national and international mobile network without internet connection. * Helps users to send event, job alerts, invitations, stock updates simultaneously to the group of cell phone users. 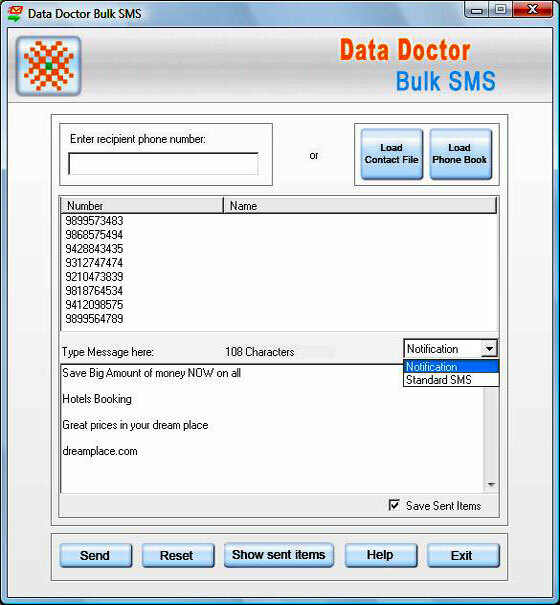 * Bulk SMS software sends text messages from PC to any other mobile phones, PDA or Pocket PC mobile device. Software can create and send unlimited number of text messages to any mobile. PC to mobile text messaging software can send text/bulk SMS to many recipients. Qweas is providing links to Global Text Messaging Software 2.0.1.5 as a courtesy, and makes no representations regarding Global Text Messaging Software or any other applications or any information related thereto. Any questions, complaints or claims regarding this application Global Text Messaging Software 2.0.1.5 must be directed to the appropriate software vendor. You may click the publisher link of Global Text Messaging Software on the top of this page to get more details about the vendor.